Modern smartphones have gradually integrated new pieces of technology traditionally found only in standalone devices. Now a contemporary handset will have GPS capabilities, removing the need for a satnav unit. High speed Wi-Fi makes a mobile more convenient than a PC or Laptop when you want to quickly browse the web or use a social networking service. Meanwhile the ever improving onboard camera equipment means that modern phones can shoot full HD video clips and capture still images at resolutions of 12 megapixels or more. The latest developments in mobile technology will see miniature projectors being installed on slim, portable handsets in the near future. 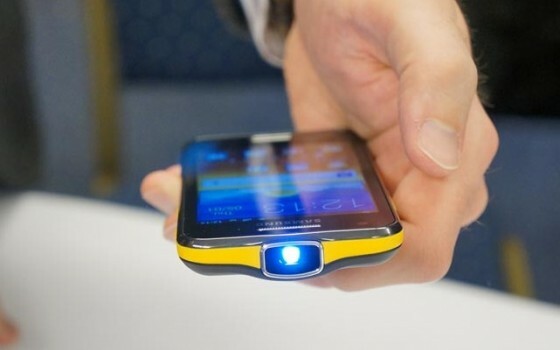 There are already small projectors based on lasers which can be connected to a smartphone and then mirror the onscreen imagery on any flat surface, making it easy to carry out on the fly presentations. However, researchers at the VVT Technical Research Centre have announced their intentions to take this hardware to the next level by installing it within a dedicated smartphone handset. The challenge faced by the researchers is whether they can develop a chip which can run the projector without consequently increasing the cost of a typical handset to the point that it becomes untenable. They are planning to court various manufacturers across the mobile world and will even be looking to see whether this technology will have an application in other markets, such as the automotive industry, according to Scientific American. There are several benefits which will come with having an integrated projector available in a smartphone handset, the first of which relates to entertainment and leisure. Consumers will be able to share their holiday snaps and home videos with friends and family without having to make everyone cluster around the small screen of their handset. While HDMI outputs are increasingly common on current smartphones, you still need a compatible display. With a miniature projector built in, your phone will provide both the media and the display in one fell swoop. For business users the implications could be even more far reaching. Whipping out your phone at a meeting to showcase the latest sales forecasts, greeting clients with rich multimedia presentations and collaborating with colleagues on interactive initiatives will all be easier using this technology. Researchers still have a few years of work ahead of them before built in laser projectors are available in smartphones but for many this new technology will be worth the wait.